Today we made an Osmun Bb Mouthpipe for a Kanstul Piccolo Trumpet. This is a pipe we do not normally stock, but can make up anytime. Like most of the Osmun Piccolo Trumpet Mouthpipes, you can move slightly more air through the pipe and into the horn, making the blow feel more trumpet-like. Also, you can move away from the lighter “toy trumpet” sound much more easily with our pipes. An easier blow with less back pressure usually leads to greater endurance. One of the fastest growing products we produce are the Osmun Piccolo Trumpet Mouthpipes. Osmun trumpet specialist Jim Becker has made many beneficial advances in these mouthpipes to make your piccolo trumpet more stable, more even, and freer blowing. 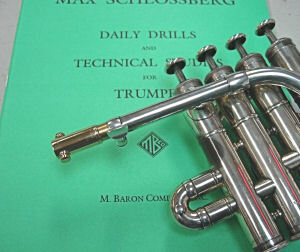 Osmun Music makes mouthpipes for most piccolo trumpets on the market in both Bb and A. We can also silver, lacquer, or gold plate to match your particular horn. Click here to see Osmun Piccolo Trumpet Mouthpipes.